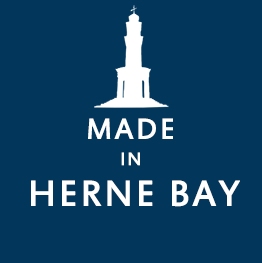 Thanks for checking out the "Herne Bay Advertising Manual" that helps you promote your local Herne Bay business/event. 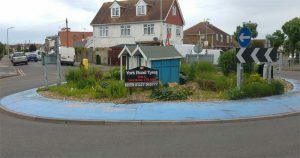 Wouldn't it be great if some amazing guy put together a detailed list of places where you could advertise in Herne Bay? That guy is me, and today is your lucky day! I’ve listed lots of places where you can promote or advertise your business, some free and some paid. Bear in mind that not all of these places and methods are suitable for every business type and advertising is just part of the puzzle to effective marketing. I really hope you find it useful and would love to know your feedback or if you have any suggestions. Hello! ?Thanks for checking out the "Herne Bay Advertising Manual" that helps you promote your local Herne Bay business/event. Wouldn't it be great if some awesome bloke put together a detailed list of places where you could advertise in Herne Bay? That awesome bloke is me and today is your lucky day! 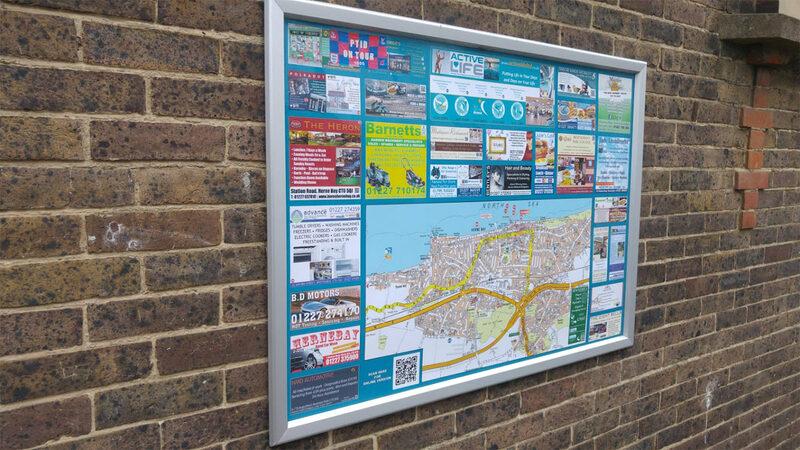 You may have seen large maps - or community borough maps with adverts on, displayed at various locations around the town. E.g. the one outside Co-op in Sea Street, or the one on the wall by Iceland. To have your sign/advert on a roundabout or local traffic site contact Marketing Force, who work in partnership Kent County Council's Commercial Services to manage and operate the delivery of its roundabout sponsorship programme. The number of actual print newspapers is now very limited with many of them moving online. Ideal if your potential customers/target market are in Herne Bay. Herne Bay has a few local community organisations that help organise events and promote local businesses. Attending networking events can help spread the word about you and your business within the local business community. These groups are local to Herne Bay. Bay Card and the Whit Card. It all depends on your business and who your ideal customer is. What is your target market? Not sure? Let me help you identify the best way to advertise your business. Call me (07949 430339) or contact me via email. Donating to a local charity is a great way to promote your business as socially aware and become part of the local community. Some charities will include you and your business in their marketing materials if you support them. This can result in some great press coverage for your business. There are lots of ways of donating to a charity and it doesn't always need to be with cold hard cash. You could donate your time by volunteering at a local charity, or if you have staff, donate some of their time. Alternatively you could select a charity as your business's nominated charity for the year and have your employees run fundraising activities for them. Perhaps you could put one of the charity’s donation boxes in your premises. If the local community has shown its support to you, by spending its hard-earned money on your products and services, then giving back to the community is a fantastic way of reinvesting and showing your community that you care. This can win you some serious brownie points and karma. Obviously this form of advertising is not suitable for all businesses and is probably more suitable for advertising trades people or local events. Some of the shops in Herne Bay allow you to put notices up in their shop windows - some for free. Try speaking with your local newsagent or coffee shop owner. Natwest Bank in Herne Bay has a noticeboard that has business cards and notices from local businesses. 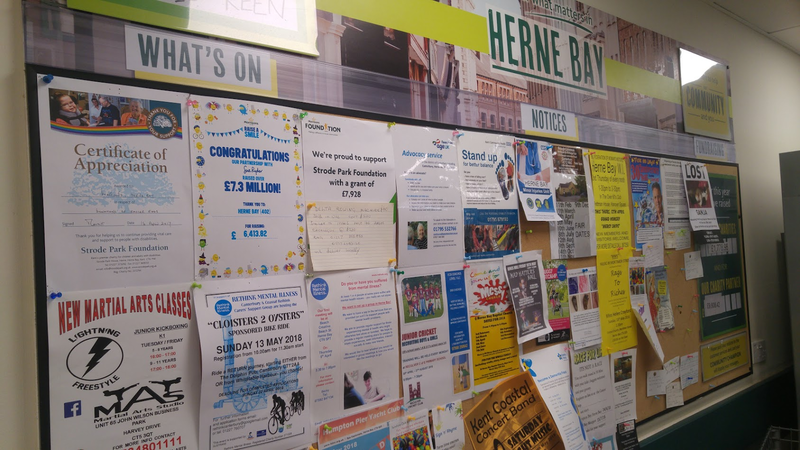 Morrison’s in Herne Bay has a large noticeboard behind the tills for people to advertise events, local notices and fundraising. Sponsoring a sports team in Herne Bay could be great advertising for your business if your target market supports a particular team or sport. You don’t need a website in order to get your business found online, but you do need to ensure it is listed in the right place. As well as the normal listings of websites you see when you search on Google, Google also has a huge database of businesses that you most definitely should add your business to. This database is called "Google My Business". Getting listed will help your business show up on the right hand side and appear on map results etc. Many local businesses already have a Google My Business page, but often these have been automatically generated by Google and are not managed by the business itself, so ensure you claim your page. There are a number of advantages to claiming your Google business listing, including being able to link it to your website, add pictures and videos, update contact information and write a nice detailed description mentioning the products and services you offer. Should your listing not show up, or you’re not sure if Google has an automatically-generated listing for your business, you can try creating a new listing. If Google finds duplicate details in their system, they’ll ask if you’d like to manage the existing page rather than creating a new page. When you’re managing your Google My Business page it’s best to include as much information as possible because Google tends to favour fully completed listings. So be sure to add pictures, videos, opening times, contact information and anything else you can possibly cram into that page to give Google exactly what it wants. Think about the number of people searching on the move. Mobile technology and mobile Internet have been a game changer. More people are searching when they’re out and about, providing you with a great opportunity to attract new custom on the move. Ensure your business is listed on Google maps by claiming your business entry. Make sure that when you add your details you are consistent across all sites. I.e. same telephone number, same format (Rd and Road). Create a structure for your Business Name, Business Address and Business Phone Number (aka NAP - name, address, phone number) and use it exactly across the web. Do not change it. Having your business listed on one of these websites/databases is called a citation. Strong citations can help rank your website/business on the first page of Google etc. Need help or want someone to do it for you? Call me… 07949 430339 or contact me via email. Consider signing up to Checkatrade.com or Checkaprofessional.com. As well as the websites they also produce and deliver leaflets/booklets that list trusted traders. Kent County Council Trading Standards and Checkatrade work in partnership to provide a recommended trader scheme to help Kent consumers choose a trader they can trust and rely upon. To get accepted onto these websites you will need to get approved. This requires you to be a genuine business and have business insurance etc. A website can obviously be viewed from people around the world, but are local people able to find it? You’re website needs to be found when people search for “[service/product/event] in Herne Bay”, or for the search engine to know where the physical location of the person searching and where your business is. Optimising your website so you’re found locally will help boost traffic and conversions hugely. It will also increase your footfall and encourage more people to get in touch personally. For most local searches, Google now shows map listings with up too, seven businesses listed. Obviously, placement in this list is highly coveted and there are a number of strategies available that will rank businesses well in local results. Use your local Herne Bay telephone number. People will recognise it as a local number and might be more likely to call. Not only that, but it helps with ranking in the search engines as Google etc can confirm your location by the area code. Carry out some search engine optimisation (seo) on your website - format your text properly and divide it up with headings. Make sure to include "Herne Bay" in your text, particularly in headings. To boost click throughs to your website or blog posts use the name of your town and local area. This really does have a significant effect on how many local clients will read your information. The more relevant the area is to your visitors, the greater the chance they will visit your website, open your email or read your blog content. Most local businesses get asked where they are located if a potential client contacts them. Your website can do a perfect picture job of answering that question by embedding an actual map that shows your location. There are many free tools, including Google Maps and Bing Maps that can help you do this. Want to make absolutely sure Google knows where you are? Then create a geo sitemap and a KML file for your website. Geo Sitemap Generator makes it easy. Just fill in your company details, download the files and upload them to your website’s root folder. Then go to Google Webmaster Tools, add your website (if you haven’t already), verify it using your Google Analytics code (other options available), and then add your geo sitemap’s URL under Site Configuration > Sitemaps. Instead of waiting for Google to find out where you are, tell Google where you are! Woah there Haydon, this is too complicated! Can you do this for me? Sure! Call … 07949 430339 or contact via email. For example, you might offer a wedding planning service to a number of different towns around Herne Bay. To target organic SEO, you could set up pages on your website targeted at each local area. These pages will be optimised for the area and include plenty of locally relevant content. So, for the wedding planning business for example, you could set up a page for each of your different target areas and write a guide to getting married in that particular area. You can use links to different local wedding venues and suppliers and write about the different styles of weddings popular in each area. The result would be a set of highly optimised pages targeting at a very wide area, but with focussed, locally relevant content. Putting this content on distinct pages will give the web pages more chance of ranking well in each area, and also builds more affinity with your audience. Reviews are a great way of advertising your business. People like to buy from people they trust and good reviews helps build that trust. It should be the goal of every local business to try and get as many reviews from their customers as possible. Getting your customers to leave reviews on your Google or Facebook pages is a great way to boost your local visibility and attract more clicks to your site and customers. Creating a system doesn’t have to be hard work to either build or implement. In fact, with a little creativity, it can even run automatically. For example, if you are already collecting customer information for your database, as part of your email marketing sequence, your early automated emails can include a simple request to leave a review along with a link to your Google+ page, Tripadvisor page, Trustpilot or any other review site that you are targeting. When you or your team follows up with customers or clients after the sale is made, ask for a review. If you sell or deliver a physical product, drop a “Will you review us?” postcard in with each purchase. However you decide to ask for your reviews, focus on making it as easy as possible for your customers to leave them. Google My Business page URL’s are long and difficult to type correctly, so you might want to consider making a reviews page on your website which has links to the different review sites you want to direct your customers to. Consequently, if you need to target lots of local areas for your business, work out which sort of targeted content you can create which will be genuinely useful to each of the local audiences. 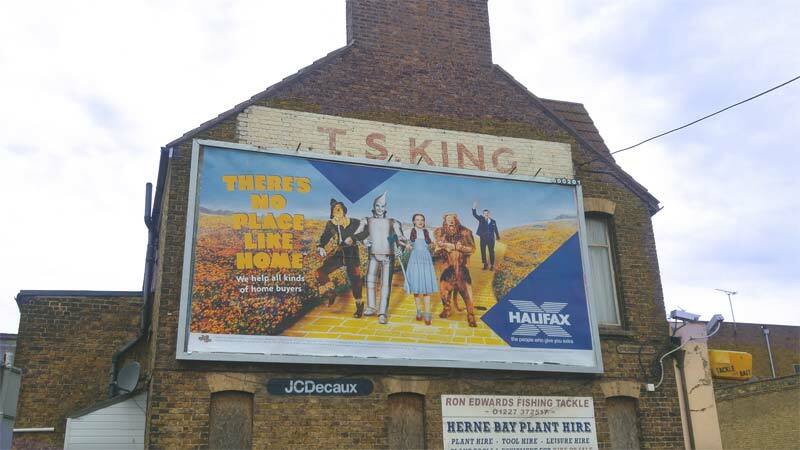 With 2.2 billion monthly active users, you’re bound to find some of your target audience on Facebook, including those who live in Herne Bay! Here are some ways to make sure your business gets found by Facebook users in Herne Bay. Facebook Places is a directory of places with a physical geographical location where people can "check-in" and leave a review. A place page is an automatic entry created when a new user checks in to review the location when there isn’t already a Facebook page set up, or when they can’t find one for your location. It's free and reasonably simple to set up a Facebook business page. If you have been living under a rock for the past few years, a Facebook Page is a timeline of messages and notices for organisations, businesses, brands and public figures. Similar to profiles, Page owners can post stories, add a cover photo, host events and more. Those who have "liked" a Page will see the Page's updates in their News Feeds. The best way to optimise your Facebook page for a local, Herne Bay audience is to make sure it is set up as a Local Business. If you haven’t created your Facebook page, make sure to create your page as a Local Business. Many people check-in on Facebook location pages. Facebook users can check into restaurants, supermarkets, bars, coffee shops and virtually any business page listed on Facebook as local, using the Facebook app on their smartphones. Page owners should ensure that their Facebook business page type is set to ‘Local Business or Place’ at either the point of creating their page or when they edit their page settings. The Facebook Group, "Herne Bay Chatter", has the most members of the Herne Bay fb groups, but be aware that your business or event must be in Herne Bay and there are strict rules for advertising. Herne Bay Chatter sometimes only accepts advert type posts on certain days. Snapchat has a younger audience so if you want to target teens this could be the ideal platform. Video is very important and audiences are consuming huge amounts of it. It's a fantastic way of creating brand awareness and getting your message out. Go and create videos! With the advent of smart phones anyone can create professional looking videos. Again, use #hernebay hashtag and include "Herne Bay" in your video title and description. Ensure you go into advanced settings and set the video location as Herne Bay. It's a good idea to get your business and website listed on local web directories. These act as additional citations. PPC or "Pay per click" is a way to advertise online and get charged each time someone clicks your advert. Paying for ads online is generally a much quicker way of getting your message in front of your ideal customer. As well as speed, it's also transparent. You can easily see how many people are seeing your advert, how many are clicking, how much it's costing and work out how many of those visitors are converting into sales. If you use Pay Per Click Advertising on Google for example, look at your paid search keywords. Place those keywords in your ads, and then put them in your local landing page headlines. Your visitors need reassurance to feel at home on your website. Don’t dismiss Bing as being a good place to advertise just because Google is dominating. Bing Ads is great if your target market is perhaps a little older and less tech savvy. LinkedIn Ads will allow you to target the largest pool of career-minded people. So if your product or service is more business orientated it might be ideal. LinkedIn is a great place to promote “B2B” offers and items and allows you to target members based on where they are living or visiting, so you can target professionals in Herne Bay. Advertise on LinkedIn. 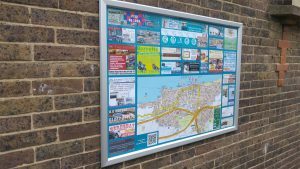 As you can see, there are so many ways that you can advertise in Herne Bay and attract thousands of local people searching the Internet to visit your website or buy from you. I understand how important it is for your customers to find you online and I can direct local customers to your website. By choosing to use my services you’ll get more from your local marketing and advertising. Not only am I dedicated, highly experienced and knowledgeable, but I will take a personal interest in seeing you and your business succeed. If you succeed, I succeed; and that’s the way I like it. Whether you have an existing website, SEO campaigns, or are looking for an agency to help with a new strategy, I can help. So, if you’re fed up with not getting found or noticed by your local customers contact me today. Local Property Expert, Internet Marketing Professional, Herne Bay resident, Dad’s taxi driver, Marshmallow Connoisseur.